- AUD rises after U.S. shutdown averted, White House talks Xi meeting. - U.S. developments support AUD even after December mortage tremor. - CBA says 0.70 should hold in AUD/USD rate, MUFG sees USD support. The Australian Dollar rose Tuesday as investors cheered an agreement struck overnight in Washington that will avert a second 2019 government shutdown, which has buoyed so-called risk assets including the Antipodean currency. President Donald Trump has secured partial funding for his proposed wall along the border with Mexico and it's now hoped he will sign a bill to fund the federal government beyond this weekend, averting the need for it to close. "This has raised hopes that Congress could pass a spending bill – if President Trump approves it – before the Friday deadline. If so, this should prove supportive for the dollar," says Lee Hardman, a currency analyst at MUFG. 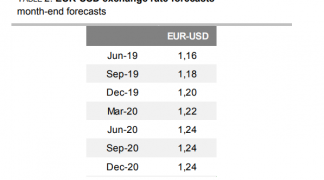 "Markets again have a risk on tone overnight (S&P future +0.5%), with AUD outperforming (0.7075), despite gloomy domestic housing data (see AUD) and JPY down (USD/JPY 110.60) against all G10 currencies," says Adam Cole, chief FX strategist at RBC Capital Markets. "The positive risk tone primarily reflects last night’s tentative agreement on US border security, including much reduced funding for the wall, which should prevent another government shutdown this week. More positive noises on US-China trade are also helping." President Trump had said last week there are no plans to meet Jingping ahead of March 01, leading markets to speculate the talks may have been falling apart just as the deadline nears. That put pressure on the Aussie at the time. Above: AUD/USD rate shown at hourly intervals with USD/CNH (orange) overlay. China's The Global Times paper, which is widely seen as a foreign policy mouthpiece for the government, published an op-ed on Sunday that analysts said demonstrated a distinct lack of progress in talks aimed at ending the trade war between the world's two largest economies. "The editorial makes clear the negotiations are basically over at this week’s level and it is all up to Trump and Xi, who aren’t going to meet before the deadline," says Jane Foley, a strategist at Rabobank. "Markets risk getting pummelled by fast-moving political and geo-political developments." Foley has been sceptical all along of whether the U.S. and China will be ever be able to resolve their differences over trade and now says there is very little chance of an agreement being struck at all, much less before the March 01, 2019 deadline that will see U.S. tariffs on imports from China automatically rise from 10% to 25%. It will be bad news for the Australian Dollar if Foley is right because the Antipodean currency is underwritten in large part by a mammoth commodity trade with China, which has seen the currency develop a strong correlation with the Renmimbi, which is under pressure from a slowing economy. 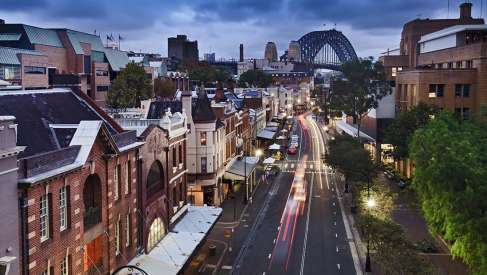 Tuesday's gains for the Aussie came in spite of another tremor in the Australian housing market, with official data revealing a -6.1% fall in the number of new mortgages issued by high street lenders during December. "It's interesting to see how little the bump in the mining giants and the milder than expected outcome of the Royal Commission inquiry has been felt in AUD, where the negative focus is on the housing market bubble unwind and RBA beginning to raise the white flag on its guidance," says John Hardy, chief FX strategist at Saxo Bank. Above: AUD/USD rate shown at daily intervals. The Reserve Bank of Australia (RBA) cuts its forecasts for economic growth last week and warned that the odds of it cutting interest rates at some point this year are finely balanced against those of it hiking rates. In others words, it has shifted to a more neutral footing from its earlier position, which had seen the bank guiding markets to the next move in the cash rate to be an upward one. Markets are now betting heavily it will cut rates before February 2020. The new guidance hit the Australian Dollar hard, leading the Antipodean currency to hand back almost all of the once-stellar gains it had made since the beginning of the year. The AUD/USD rate is now up just 0.27% for 2019, after having risen almost 3% in January. "AUD/USD is at risk of testing important support at 0.7000. However, AUD/USD is unlikely to sustain an undershoot below 0.7000 considering that Australian interest rate futures have already fully priced‑in a 25bps RBA cut by year‑end," says Commonwealth's Haddad, in a note to clients. 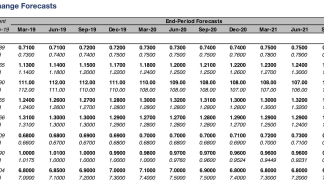 Pricing in the interest rate derivative market now implies an RBA cash rate of just 1.20% for February 2020, which suggests investors believe an interest rate cut from the current 1.5% level is almost certain to be delivered before then. The RBA has held its rate at a record low of 1.5% for over two years, citing below-target inflation and an economic outlook that is insufficient for it to support a sustainable return of the consumer price index to the 2%-to-3% target band. Higher inflation on a sustained basis will be required for the RBA to raise its interest rate, but that itself will first require a pick up in growth and stronger increases in workers' pay packets. But both of those look unlikely. Slower global growth and weaker household spending are the main factors behind the RBA's forecast downgrades, although some economists say the RBA is still being too optimistic in its outlook for the domestic economy. They claim falling house prices could have a larger than anticipated impact on household spending. House prices are falling steadily in Australia's main cities and many economists now fear a "hard landing" for the real estate market. "These growth forecasts are still too optimistic and will likely be downgraded in coming quarters as soft consumption & falling residential construction become more apparent," says George Tharenou, an economist at UBS.